I've run across a smattering of interesting tea-related items lately. I thought I'd share a few. 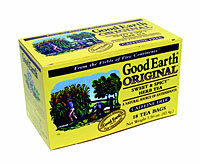 I don't care much for chai, but this time of the year (brrr...) I find myself gravitating toward Good Earth's Original blend. It's not unlike chai, but it lacks that ingredient - I think it's cardamom - that puts me off of the latter. It's available in two versions - one with caffeine and the other, which is made with rooibos, has none. What brought this all to mind was the recipe for Good Earth Zucchini Bread that I found here, which actually uses the tea as one of the ingredients. The more you find out about tea, the more you realize that the issue of How To Make Tea is not such a simple one. Here's a rather detailed entry on the topic. If you scroll down to the bottom of the page you'll find numerous links to other "how to" pages. Last up is a tale, from the Australian press, about an Australian man whose ginseng teabags were not what they first appeared to be. Hint: He was arrested for possessing them.